(CNN) -- So much for destiny. The Royals seemingly had karma on their side and were ready to put a Hollywood ending on a memorable season, but the baseball gods had a different plan. For they had created a pitcher who had a performance that surely isn't that of a mortal. The San Francisco Giants celebrate after Game 7 of the World Series against the Kansas City Royals, October 29, in Kansas City, Missouri. The Giants won 3-2 to win the series. 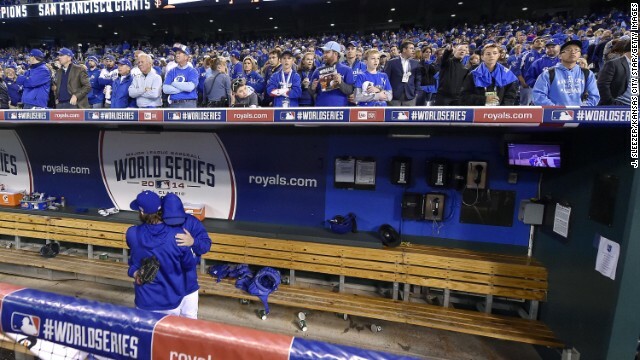 Kansas City Royals pitchers Danny Duffy and Aaron Crow embrace in the dugout after a 3-2 loss against the San Francisco Giants in Game 7 of the World Series on October 29, at Kauffman Stadium in Kansas City, Missouri. 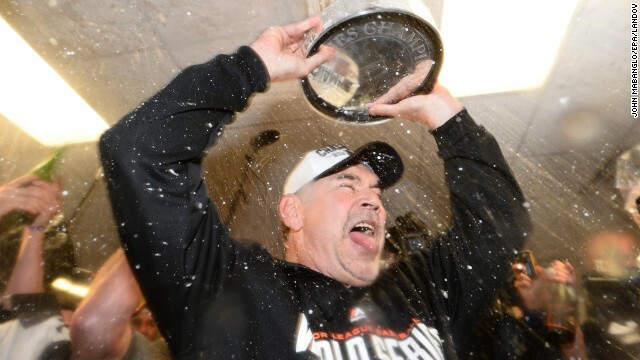 San Francisco Giants manager Bruce Bochy celebrates with the World Series trophy after defeating the Kansas City Royals 3-2 in Game 7 of the World Series at Kauffman Stadium in Kansas City, Missouri, on October 29. 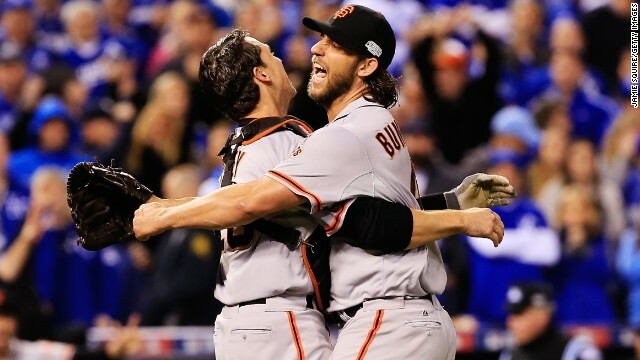 San Francisco Giants players Buster Posey, left, and Madison Bumgarner celebrate after defeating the Kansas City Royals 3-2 to win Game 7 of the 2014 World Series at Kauffman Stadium on October 29 in Kansas City, Missouri. Bumgarner was the series MVP. Members of the San Francisco Giants celebrate their 3-2 win over the Kansas City Royals in the 2014 World Series at Kauffman Stadium on October 29 in Kansas City, Missouri. Madison Bumgarner of the San Francisco Giants pitches against the Kansas City Royals in the fifth inning during Game 7 of the 2014 World Series at Kauffman Stadium on October 29 in Kansas City, Missouri. San Francisco Giants' Michael Morse reacts after hitting an RBI single during the fourth inning of Game 7 of baseball's World Series against the Kansas City Royals on October 29 in Kansas City, Missouri. 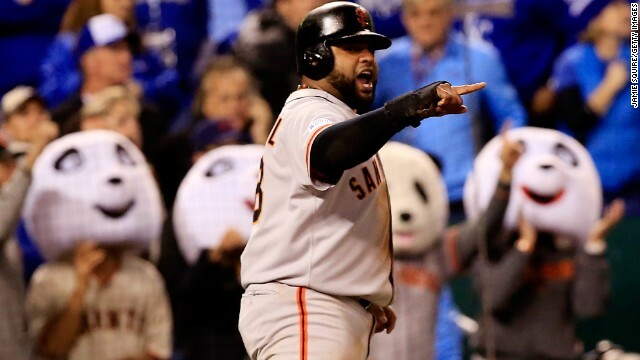 San Francisco Giants third baseman Pablo Sandoval celebrates after scoring in the fourth inning against the Kansas City Royals during Game 7 of the 2014 World Series at Kauffman Stadium on October 29 in Kansas City, Missouri. Kansas City Royals second baseman Omar Infante tries to make a play in the fourth inning against the San Francisco Giants during Game 7 of the 2014 World Series at Kauffman Stadium on October 29 in Kansas City, Missouri. 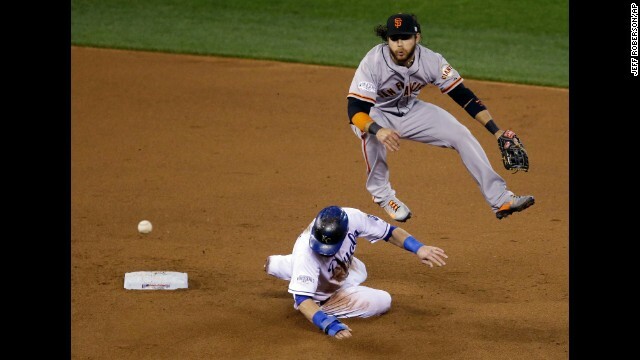 Kansas City Royals' Alex Gordon is out at second as Brandon Crawford of the San Francisco Giants turns a double play on a ball hit by Salvador Perez during the fourth inning of Game 7 of the World Series on October 29, in Kansas City, Missouri. San Francisco Giants starting pitcher Tim Hudson, left, walks off the mound after being relieved during the second inning of Game 7 of the World Series on October 29 in Kansas City, Missouri. Kansas City Royals catcher Salvador Perez grimaces after being hit by a pitch in the second inning of Game 7 of the 2014 World Series at Kauffman Stadium on October 29 in Kansas City, Missouri. Kansas City Royals third baseman Alex Gordon hits an RBI double in the second inning against the San Francisco Giants during Game 7 of the 2014 World Series at Kauffman Stadium on October 29 in Kansas City, Missouri. 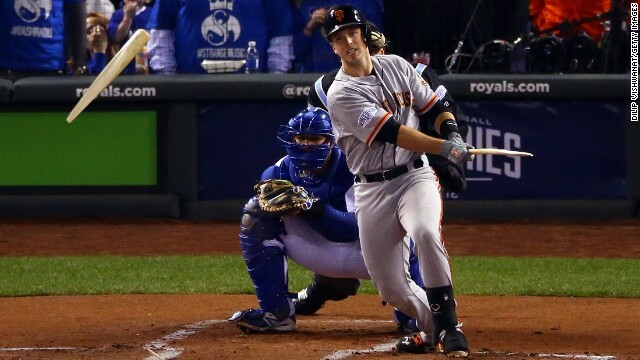 San Francisco Giants catcher Buster Posey breaks his bat in the first inning of Game 7 of the 2014 World Series at Kauffman Stadium on October 29 in Kansas City, Missouri. 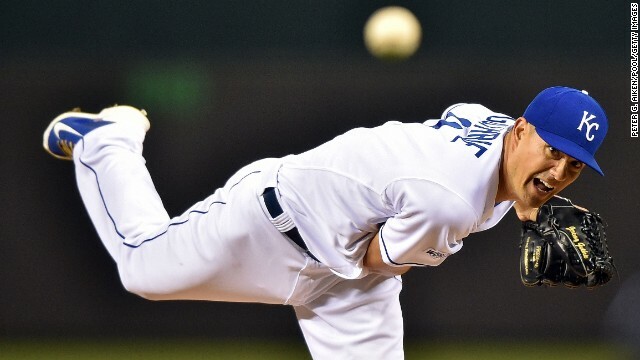 Jeremy Guthrie of the Kansas City Royals pitches against the San Francisco Giants in the first inning during Game 7 of the 2014 World Series at Kauffman Stadium on October 29 in Kansas City, Missouri. Tim Hudson of the San Francisco Giants pitches in the first inning against the Kansas City Royals during Game 7 of the 2014 World Series at Kauffman Stadium on October 29 in Kansas City, Missouri. 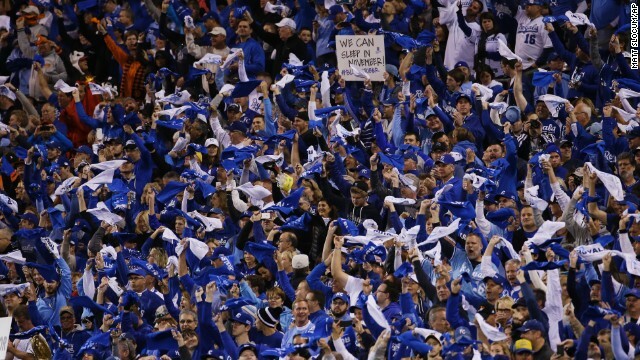 Fans wave towels before Game 7 of baseball's World Series between the Kansas City Royals and the San Francisco Giants on October 29 in Kansas City, Missouri. Led by Most Valuable Player Madison Bumgarner, the San Francisco Giants won an exciting and intriguing World Series Game 7 by a 3-2 score. In the second World Series matchup of wildcard teams, it wasn't to be for the young Royals, who even got the tying run to third base in the ninth inning. But the Giants had Bumgarner, and no one was going to score against him. Early on, the Royals had to think things were going perfectly. 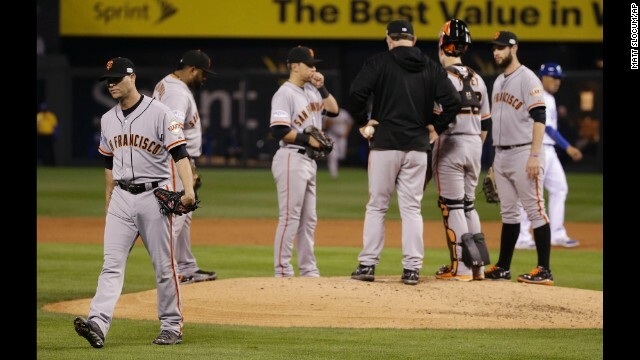 They knocked out Giants starter Tim Hudson in a hurry, and it looked like San Fran skipper Bruce Bochy was going to have to make repeated calls to his bullpen. They were keeping the game close, even though they trailed by a run. I've seen a lot of great pitching performances. 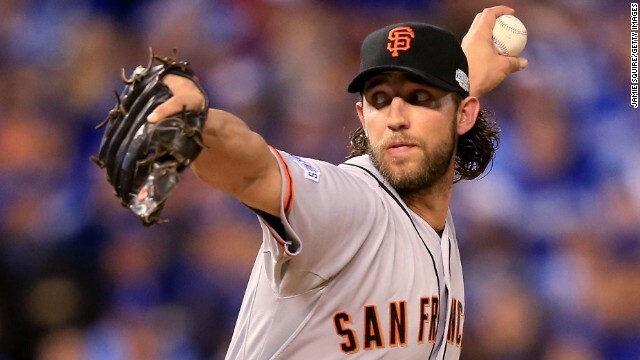 What Madison Bumgarner did over the last 72 hours is unlike anything I've seen. Incredible. Sure, the Giants had Bumgarner, their ace, available, but he just threw a complete game three days ago. Even if he came in, it seemed impossible he'd throw more than a couple innings. He threw an inconceivable five. You know the last time that's been done before Wednesday. Probably never. "I wasn't thinking about finishing the game or how many innings I was going to go or pitch count," Bumgarner said. "I was just wanting to get outs." 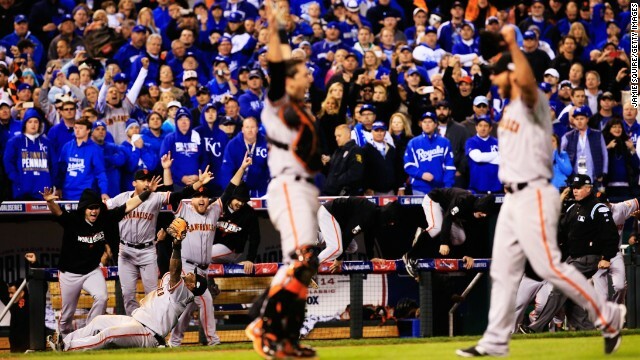 Bumgarner finished the World Series with two wins, one incredible save and an ERA of 0.43. Asked if he was fatigued after such a magnificent performance, the 25-year-old star admitted, yeah, he was. "I can't lie to you any more; I'm a little tired now," he said with a chuckle. 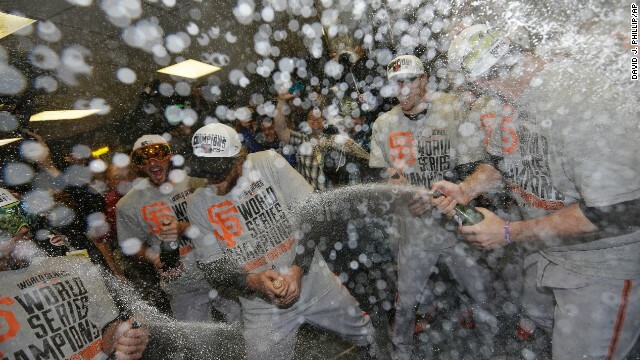 With Bumgarner locked in and two out in the ninth, San Francisco fans couldn't be blamed if they were celebrating. But K.C. still had a little life. After all, these are the Royals who appeared doomed in the American League Wild Card game, only to rally for a win. Kansas City's Alex Gordon was the last hope, and he laced a liner to left center. 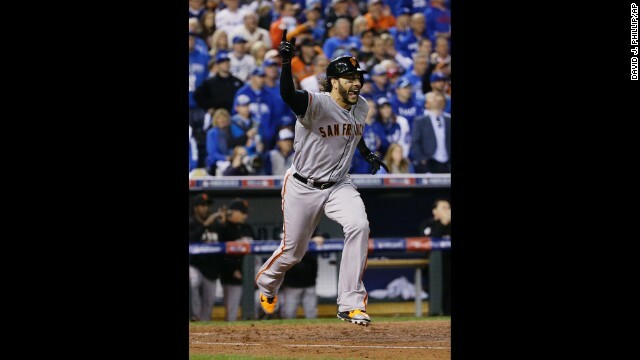 Hearts in Kansas City sank as it appeared Gregor Blanco might catch it. Their hearts raced as the ball fell and skipped by the outfielder and rolled to the wall. Gordon headed toward third as Juan Perez fumbled the ball. Could it be? Would Gordon turn for home and score the most improbable of runs? San Francisco manager Bruce Bochy said he was just thinking: "Let's get the ball in because Gordon can run." Perez was able to pick up the ball and get it back to the infield in time to keep Gordon from scoring. Then Bumgarner closed out the game, enticing Salvador Perez to pop out. "To end up losing the ball game by 90 feet, it's tough," Royals manager Ned Yost said. "The hard part about this is, you work all year (beginning in February) to climb to the top of the mountain and then -- boom -- you fall back, and you gotta start right back at the bottom next year." Royals fans have waited three decades (it seems even longer) but despite a tough loss, they were still proud of their lads. "The @Royals may have lost, but this team and that city is all winner. Thanks for a GREAT post season. Congrats Giants and GO @KCChiefs!!!!" "Modern Family" actor Eric Stonestreet tweeted. The @Royals may have lost, but this team and that city is all winner. Thanks for a GREAT post season. Congrats Giants and GO @KCChiefs!!!! "Never been prouder of @Royals on a great season and an absolutely unforgettable, drama-filled playoff run. Well done, fellas," White House press secretary Josh Earnest wrote. "I love my @Royals!!! Thanks for the best Series I've seen in 29 yrs! Congrats San Francisco Giants," added comedian Rob Riggle. I love my @Royals!!! Thanks for the best Series I've seen in 29 yrs! 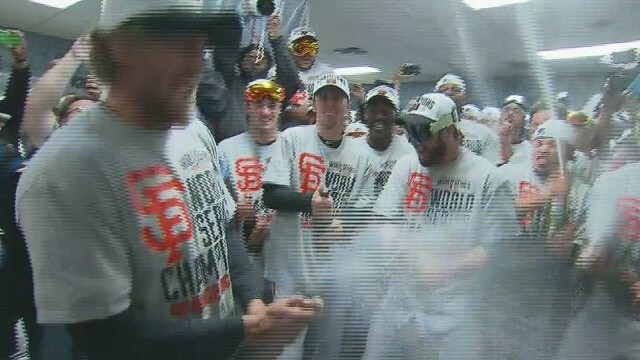 Congrats San Francisco Giants. Fans at Kauffman Stadium stayed after the end and even broke into a loud "Let's go Royals" chant. Years from now, when Jeremy Affeldt shows off his World Series rings, people will ask him about watching Madison Bumgarner pitch. Just told Affeldt about the scoring change, that he received the win. He immediately told his wife, they cried and embraced. They'll have long forgotten, if they ever knew, that Affeldt had a lower ERA in the 2014 postseason then even the Giants star. No one scored on Affeldt. No one. 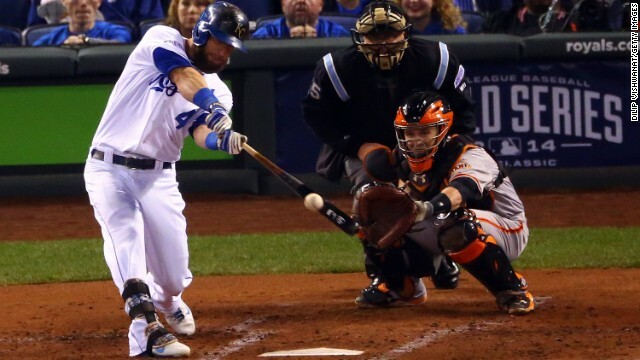 In Game 7, before Bumgarner stole the headlines, Affeldt blanked the Royals for 2 1/3 innings. It earned him the win (Originally the win was given to Bumgarner but the decision was changed later). Affeldt has now pitched in 22 consecutive playoff games without surrendering a run. Only the legendary Mariano Rivera has done better. 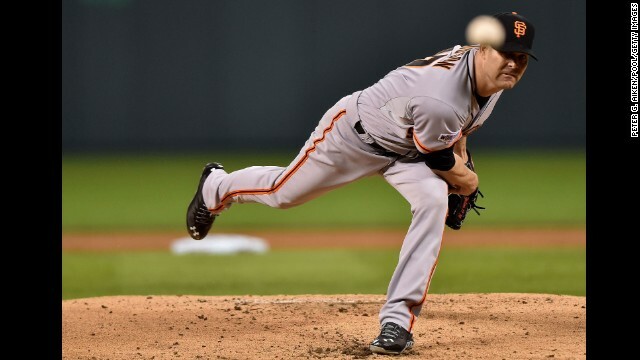 "Affeldt, he is incredible," Bochy said. "He's played a critical role in these three championships." San Francisco fans are used to watching their team win the World Series on the road. Each of their clinching wins has been a road game. According to CNN affiliate KRON, fans took to the streets in the Mission District and near Civic Center Plaza, where there had been a public watch party. And one person was shot in the arm, police told the station. The suspect wasn't caught, police spokesman Gordon Shyy told KRON. Only a few people had been arrested, he added. Mayor Edwin Lee took to Twitter to announce the victory parade would be held Friday.